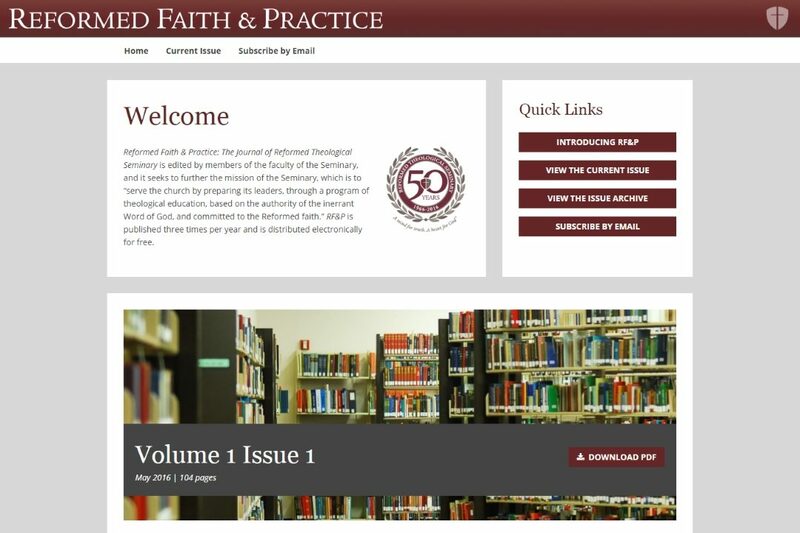 As part of celebrating their 50th anniversary in 2016, Reformed Theological Seminary (RTS) decided to produce its own journal. It would be called Reformed Faith and Practice, and would be produced three times per year, with a twist: it would be published exclusively online. RTS’s main website had been redesigned by 5MT a year earlier, and they returned to us for this project—which ended up being one of the most fun we’ve ever undertaken. We provided RTS with custom web design: we wrote the code for a 100% customized, fully responsive WordPress theme to display the journal, echoing the main seminary website’s color scheme and logo design. We also created Custom Post Types. This makes posting reviews and articles (the majority of the journal’s content) as simple as entering content in the required boxes, instead of having to reformat it every time. Since the journal is not published in print, we even developed a way to publish the online content in separate issues, which is an unusual ability for websites.